"The kitchen blends in well with the space perfectly. " Enigma Lighting is one of the leading lighting suppliers in Europe. Their clients include major retailers, hotels and shopping centres across the UK and Europe, optimising the latest lighting technology with modern design and high quality project management. Enigma’s new design studio in Manchester serves as their showroom. The studio showcases their range and provides an inspirational space for clients to meet with project managers and kick start the design process. Paul Shoosmith, Director at Engima needed a kitchen for the staff and clients to enjoy refreshments from. 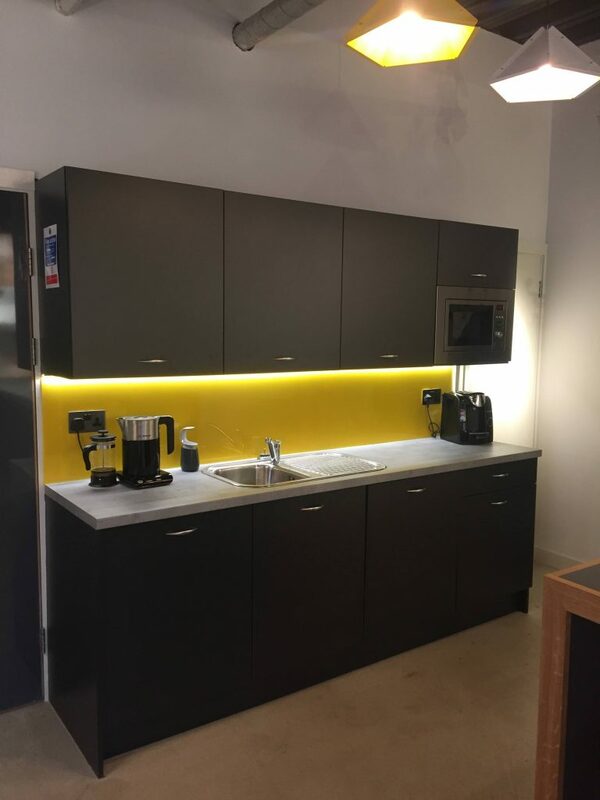 The brief was for the kitchen to reflect the contemporary design of the showroom and John Strand were selected to supply a bespoke solution kitchen. Paul talked to us about the project. Can you tell us about your new showroom? The showroom was a new build from the shell of an existing unit. It is an important space to showcase our products and for designers to meet with clients. The project was 4 months from start to finish. How did you find out about John Strand? We were recommended by Day2 interiors. We wanted to establish a relationship with someone via a recommendation. It worked! What was the appeal of a bespoke kitchen from John Strand? We liked the simplicity and finish of the products. How would you describe working with John Strand from the design stage to delivery? Very quick and easy. Delivery was made the day before install and a recommended local contractor fitted. What do you think of the finished kitchen? The simplicity was key. The kitchen blends in well with the space perfectly. Would you recommend John Strand MK and if so, why? Yes for service, price and lead time.